Additional Layer 7 Application Context Support:SYMUPD (Symantec LiveUpdate traffic, which includes spyware definitions, firewall rules, antivirus signature files, and software updates), MAXDB (SQL connections and queries made to a MaxDB SQL server), and GITHUB (web-based Git or version control repository and Internet hosting service). Expanded OS support for Identity Firewall: Identity Firewall support for user sessions on remote desktop and application servers (RDSH) is now expanded to include Windows Server 2012 with VMware Tools 10.2.5 and Windows 2012 R2 with VMware Tools 10.2.5. The following tables is part of the Functionality Updates for NSX and could be found at docs.vmware.com. 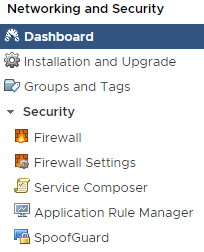 It lists the not supported functions of NSX through the vSphere Client (HTML5).